I'll keep this as breveted as possible. A guy has offered these two swords to me, has not mentioned a price. I collect German WWII items so this is out of my field of expertise. My basic questions are this, are they real? What is a price I can buy them at and not get hurt being we can't see the tangs of the swords. Many thanks and any advice is appreciated. Also, these are the only pics that he sent me. Ok, if you don't take them, can I have a go? They look very interesting, and both are genuine. Cannot give you a price indication, but if it is not excessive then go for it. Both have some very promising features worth investigating. Love that tsuka on the shorter one! Go for it, or pass them on. They are real and look to be rather nice. Condition is above average. Without seeing the nakago (tangs) it is hard to say what they may be worth but I would probably feel comfortable spending up to $5000 for the pair, provided the blades show no serious flaws. I'd agree with Chris, $4k would be a good low number you couldn't go wrong with as long as there's no fatal flaws and would look to spend maybe $5k myself (if I had $5k currently ) . They both look quite interesting and I'd like to see better pictures including the tangs if you were to buy them. ill 2nd,3rd,4th and 5th all those motions... let us know If you purchase them and the outcome, If not pass the info on to a nmb member to purchase cheers. Im going to be a bit of handbrake here guys, Im getting the feeling were being taken advantage of for our knowledge here. like he stated he knows nothing about Japanese swords at all, and this was a very easy one to see (real) and then to ask price range!!! to me it feels like were being used up and getting nothing in return for our good will and knowledge, maybe we should be asking for mandatory donations for this type of scenario, as for all we know this gentleman could be a dealer, as he is new to the board. best regards and no hurt feelings please. 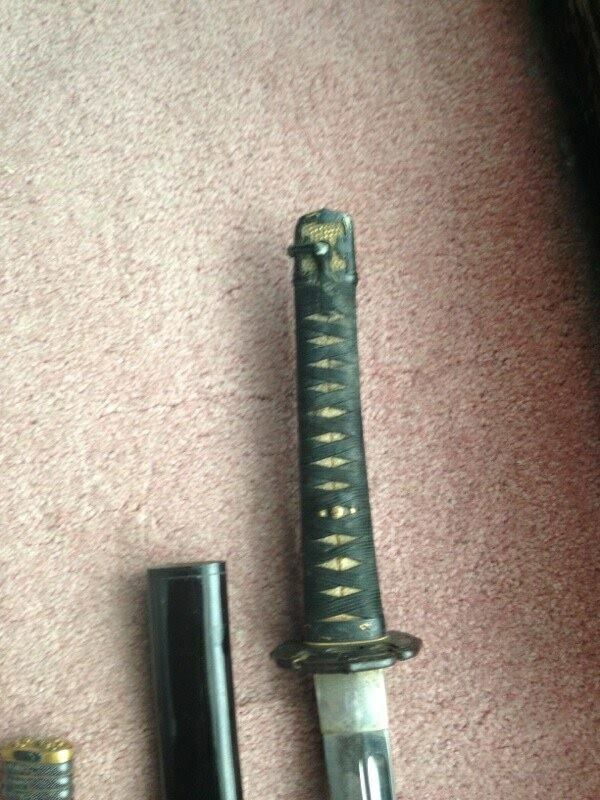 I'm no expert but I've been looking at a lot of stuff while trying to research my own first antique sword; my first impression is the Katana at least is likely WW2 vintage. The tsuka is also wrapped incorrectly, making me question it's value even more and would make me want to look a bit deeper. 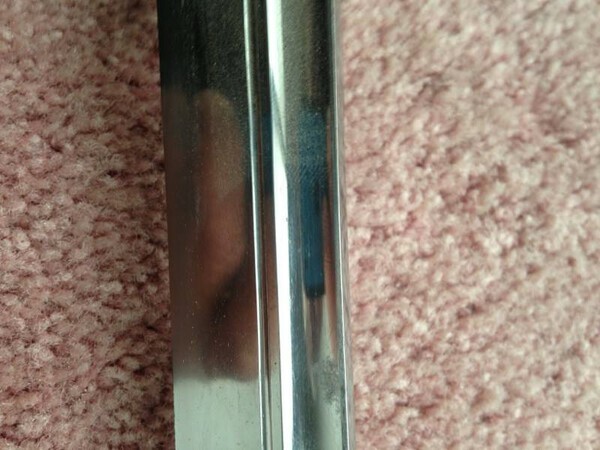 The pics of the blade and hamon do look promising though... I doubt I would drop $5K+ on those blades without a lot more info digging and AT LEAST pulling of the tsuka to examine the tang(s) however. To the OP, a random internet appraisal is not a good way to come out ahead (remember, you get what you pay for! ); best to take the information given as a starting point for your own crash-course in Nihonto studies or shell out some $$$ for a real appraiser first. The difference between what me or Chris would pay as collectors and what a dealer would pay may be vastly different, also if the OP is just a dealer looking to profiteer then it's a complete minefield with restoration costs and very long timeframes before you even get around to trying to sell. Even then the best 2 ways are through auction where you have no idea what the return will be or via an already established dealer who's going to charge 20% commision. So unless the Op's thinking about taking up collecting Nihonto then without first reading books even at $3k they could get burnt without good decision making. The smart thing to do would be to quickly flip them to Chris or Kronos without messing with them for the quick gain knowing what he's picking them up for, assuming they were both serious and his intent is to make some money. 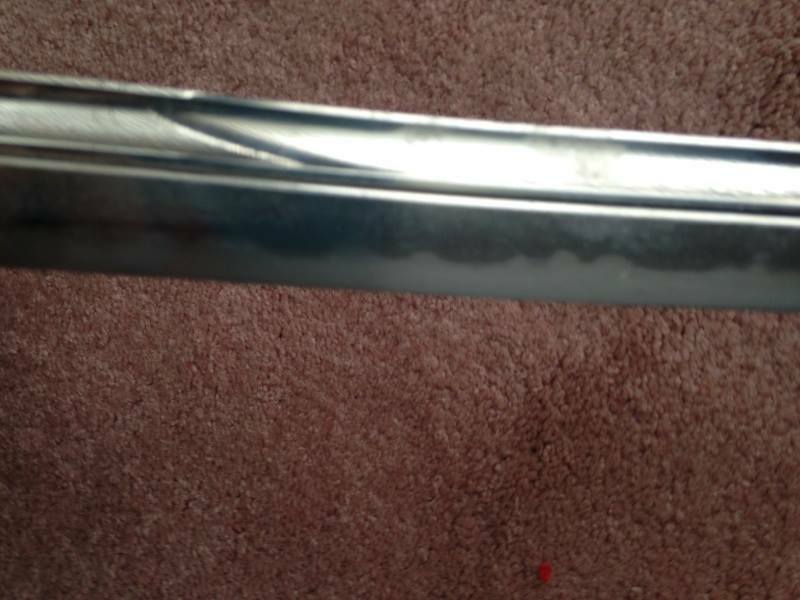 If these are in those price ranges, I don't see someone like Josh being able to pull those kinds of prices on his own without consigning them to a reputable dealer who has the connections and knows the market for these types of swords, and potentially waiting for some time for them to sell. As one of my mentors always says, "a quick dime is better than a slow quarter." Now if he wants to keep them, that's good too. He will have some nice pieces to study, research, get interested in the hobby and maybe turn out to be a new collector, something that I see a lot of discussion here over the concerns of attracting new people to the hobby. In regards to asking for help, I doubt there are many of us, if any that haven't asked for and received help and ended up better off after the fact at some point. In this case, there is a good opportunity and not enough time to study up to make an informed decision without asking. It's probably one of those pull the trigger or the deal is lost scenarios. And again, it might attract a new collector by helping him out. I started buying and selling bayonets for extra $ to buy guns (buy for $10 sell for $20-$30 each). Then I got into certain bayonets and started upgrading, made enough to get into fighting knives. Bought and sold fighting knives keeping the ones I liked, made enough to start buying swords. Bought and sold some here and there keeping the ones I like and now trying to start upgrading my collection. I've had help all along the way and anytime anyone asks for help I'm more than happy to share what I may or may not know. I know this is different with swords, but I always like to give kids that show interest in military stuff a knife, bayonet, flag, helmet or something I may have on my table that they're messing with. A $100 knife might not seem like much, but it's fun watching their eyes get big and hopefully it leads them to entering the hobby later in life. Plus, I like to think it's good karma. One of my buddy's son refuses to take anything for free from me so I tell him it's going to cost him a whole dollar. He's probably 7 or so, and his dad has him shake on it and thank me for the deal every time. No flame at all, but I do not agree with you. It costs people nothing for an opinion, and if the poster is a dealer or just looking for info..so what? We are the customer base anyways. 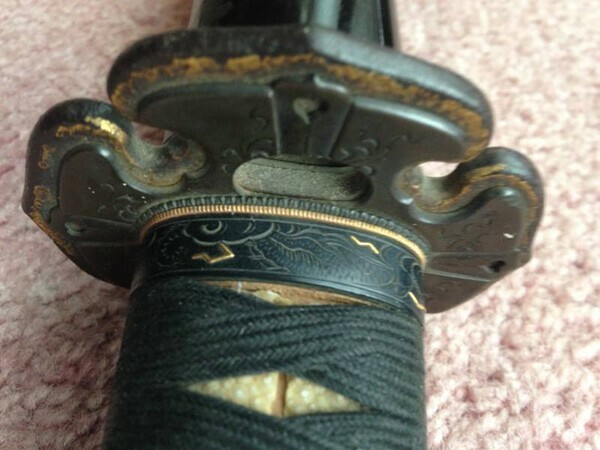 If you are a collector or dealer who knows nothing about Nihonto, and suddenly are presented with 2 swords...and maybe have a few hours to decide if you want them..where do you go? We always say people should ask before buying fakes, so we cannot fault them if they do ask. No donations needed for this. People who want to give their opinion can do so, others can refrain. I don't mind if dealers ask about values...maybe we get offered swords before the rest of the market gets them. As long as they don't abuse the help, and are forthright about their intentions, I can see no harm done. "What is a price I can buy them at and not get hurt?" Without seeing them in hand, i would find it too much of a gamble, even at a low figure. Curious to know what makes you say that the tsuka is incorrectly wrapped. Care to share? Any sword is worth what someone will pay for it, and it's obvious that several of you are expert on that issue. 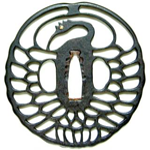 The daito has a Shinto or later sugata. It could very well be a Gunto. 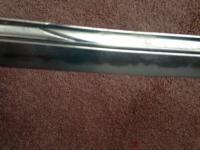 Since I'm a Kamakura-Nambokucho snob, I'd leave this sword to whoever wants it. 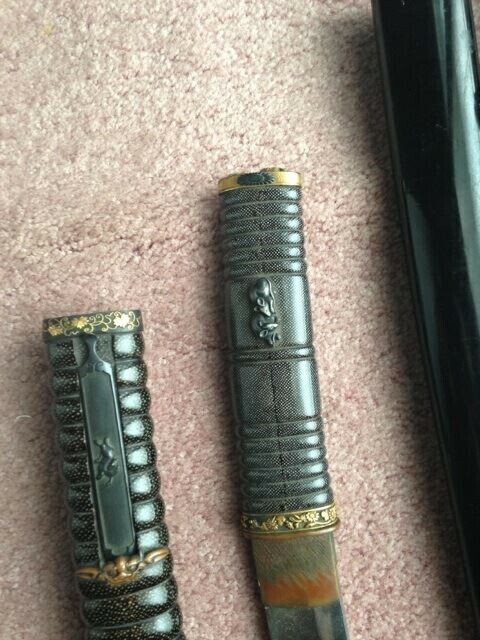 The wakizashi, hira zukuri, substantial sori, about 35 to 38 cm, could be Nambokucho, a Sunnobe tanto. Polish on both needs to be renewed. That's at least $1000 apiece. 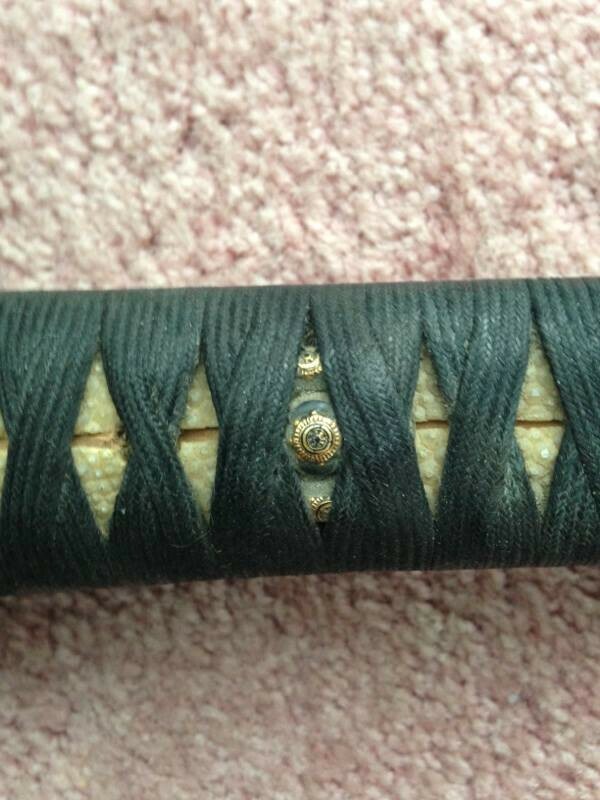 Notice the peculiar disturbance of the curvature of the edge of the wakizashi about 1/3 up from the habaki. 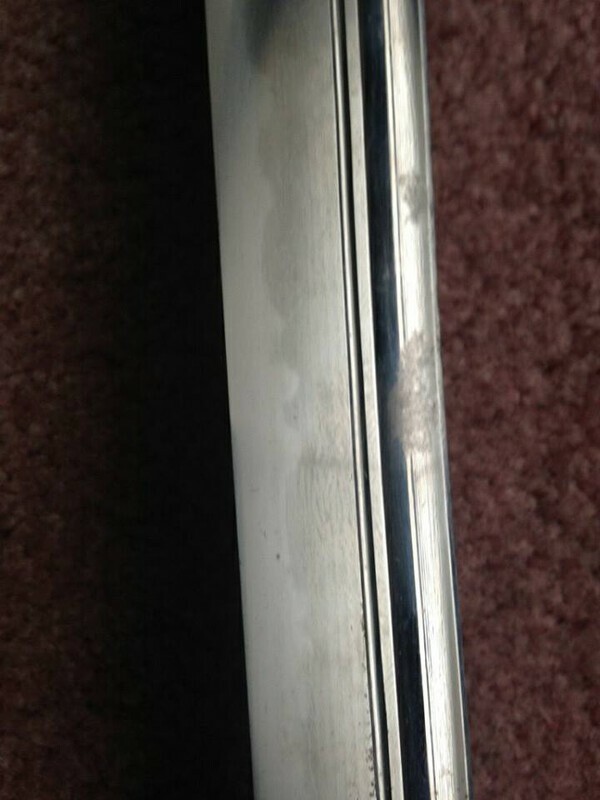 Looks like the blade is bent to me, but it could be just a scoop out of the edge from corrosion or reshaping after damage. The same koshirae is quite nice, quite distinctive, but likely could use some repair/restoration. Actually, it looks like a Kaigunto theme. I think, just from what I'm seeing, I might risk $400-$500 on this piece. Without better pictures, I'd guess Den is Soshu. On anything Shinto or later, Den is "chop suey." 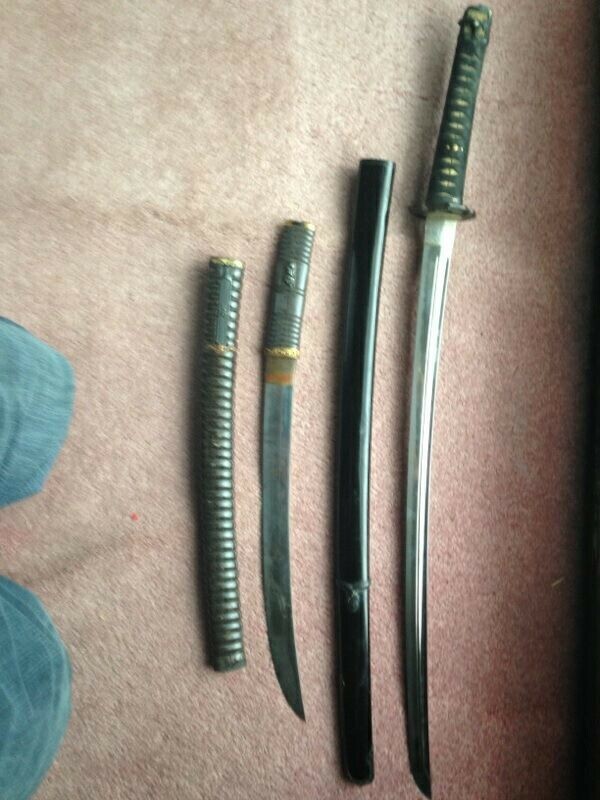 So, original question...Up to $1000 for the pair, sell the gunto undisturbed, research the wakizashi. If worthwhile, polish.